At first glance it would seem a retroactive move by the Germans to create a self-propelled 7.5 cm gun using the Pzkw. IV chassis; after all, this same gun was already available in an all-around traverse turret on the same chassis and would seemingly be a better idea. 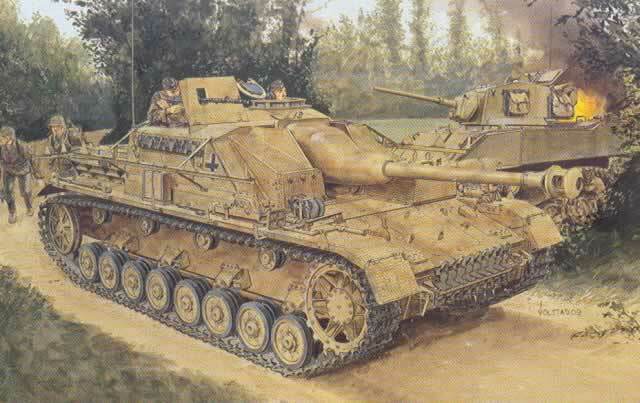 But the Germans had a great number of doctrinal uses for self-propelled guns, and as the Alkett factory had been basically put out of business by Allied bombing (hence the end of StuG III production due to a lack of chassis) tests were made in late 1943 to fit the StuG III casemate to the Pzkw. IV chassis. The result was a success, and between December 1943 and March 1945 more than 800 of these vehicles were built. The chassis mirrored the Pzkw. IV chassis so they began using Ausf. H chassis and ended up with late model Ausf. J chassis. This vehicle has never been as popular as it more widespread Pzkw. III based forebearer, but it has been another version of the Pzkw. IV chassis for fans of that vehicle. The first kit of one in more or less standard scale was the Monogram one from 1970 in 1/32 scale, and later ones was released by Tamiya and Italeri. DML released two kits of this variant, the last one being a late-production variant which came out in 1998 (No. 6107). They have now revisited the kit and by combining parts of their excellent Pzkw. IV Ausf. H kit and the StuG III Ausf. G kit they have a new mold StuG IV. As such, the kit comes with a partial interior and all of the predetermined optional position hatches and viewers to permit an interior to be fitted to the rest of the hull. As with other recent DML kits with “schuertzen” armor shields, it provides the hangers and fittings in styrene and the plates themselves in etched nickel. Note that this version has a double-thickness fitting on the upper sections of its center three panels (MD1 parts) as well as extra bolt heads on the M sprue for each set of shields. The rest of the kit follows the earlier “donor” kits. As with the earlier kits this kit has another new hull pan which is complete less the stern plates, separate final drives, and much of the surface detail simulates screw or bolt holes; it also has an applique lower glacis plate. Drivers now consist of only four parts; the separate bolts are gone. Bogies are now nine piece affairs without separate tires. New details are provided for the tow hook at the rear of the hull as well. The upper hull again consists of a rear deck and framework with applique sides, front and rear engine intake components and fenders. Note that the fenders need trimming in Step 8 to permit the necessary modifications for this version. The muffler has a central tube section and six add-on parts to complete it along with a “slide molded” exhaust pipe. All ports and hatches are separate parts so they can be posed open. While no interior components for the lower rear hull are yet present, the hull still provides a rudimentary firewall for the engine compartment, and the various vents and louvers are also posable either open or closed. Note that all ports have clear styrene inserts as well. Using the StuG III parts the kit comes with a high level of interior parts, including the gun, commander’s cupola assembly, floor, and the radios and stowage racks for various bits on each side of the casemate. A loader’s machine gun is provided for the kit along with the folding shield and mount. The only downsides (one minor and one medium) are the retention of the “Magic Track” single link tracks and the lack of zimmerit paste on the exposed parts. The former is not bad as “Magic Track” is among the best of the single link types but the other is one piece, cement and done. Zimmerit is up to the taste (and skill) of the modeler, but most intermediate level modelers appreciate having this step done for them. Technical assistance on this kit was provided by Steven Van Beveren, Notger Schlegtendal, Thomas Anderson, Tom Cockle and Gary Edmundson. A total of seven different finishing options are provided with this kit: 34th Infantry Division, Italy 1944 (tri-color stripes with black crosses); Unidentified Unit, Kurland 1945 (tri-color upper hull, sand lower with black crosses); StuG Brig 277, East Prussia 1945 (whitewash patches over sand with black crosses); StuG Brig 311, Ukraine 1944 (sand, black 111); Unidentified Unit, Lake Balaton area, Hungary 1945 (sand with white spots, black crosses); Unidentified Unit, Poland 1944 (fine dot camouflage, black crosses); 17th Panzergrenadier Division, “Goetz von Berlichingen” Kamp, Normandy 1944 (redbrown stripes over sand, “Bruno”). A very small sheet of Cartograf decals accompanies the kit. Overall this is a nicely done kit which will probably drive unbuilt 1998 kits off shelves and into flea markets. But all of the recent kit are worth the cost in the amount of hassle they reduce and savings on after-market “upgrade” bits.